Convert a spare bedroom, unused home office or even a closet space into a craft haven with these sewing room design ideas. Grab your favorite sewing room design ideas for an inspiration board complete with quick tips, inspiring photos, fabric swatches and DIY projects. Use these sewing room design ideas to fit within your own space and budget constraints. Whether you're looking for useable storage or fun storage room accents, these projects are perfect for jazzing up your sewing room space. From fabric panels to chair pads, these projects will not only help you accessorize your work space, but they'll make it more fuctional and comfortable. Screen Fabric Panels: Use fabric panels as sewing room design ideas when you want to offset a sewing corner or nook from the rest of a room. These panels transform a wood screen into a pretty room divider. Striped Chair Pad: Make your sewing chair a comfortable one with this blue and white striped crochet chair pad, accented with crochet daisies. Simply Reversible Window Valence: Tie your sewing room design ideas together with a simple window valance. You can use the same fabric for a skirt around your cutting and/or tables. Decoupage Sewing Storage Box: Use paper sewing patterns to cover a plain wood box and turn it into decorative storage for fabric and sewing patterns. Giant Button Wall Art: Sewists, crafters, kids, and adults will LOVE this Giant Button Wall Art! Made with a large wooden circle, this simple DIY decor project is perfect for adding a splash of color to a small corner or your children's bedroom. Recycled Rug Pouf: Perfect for lounging or dreaming up your next sewing project, this rug pouf is thrifty and super easy to make...and it makes the perfect addition to your sewing room or living room. Baskets are great for your sewing room because you can use them to store anything! Fabric, bobbins, thread, yarn, and so much more can be stored and organized into baskets...best of all, they make for cute (and functional) decor. 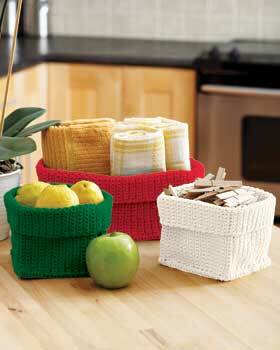 2-Strand Fold Basket: Crochet your own storage baskets for fabric and other supplies for fun sewing room design ideas. Chicken Wire Baskets: Make your own baskets in a rustic, country style with inexpensive chicken wire. Crochet Stash Baskets: Use this free beginner crochet pattern to create these handy baskets that can be used to store any number of sewing essentials. Basket Insert: Line your baskets with an old bedsheet with this useful and upcycled project. Crocheted Stash Buster Basket: The great thing about this basket is that it will help you use up your yarn stash in addition to helping you stow away old sewing supplies! Keep your inspiration close at hand with these DIY inspiration boards. Great for having by your working desk, these boards help you keep track of all your notes, project ideas, and shopping lists. 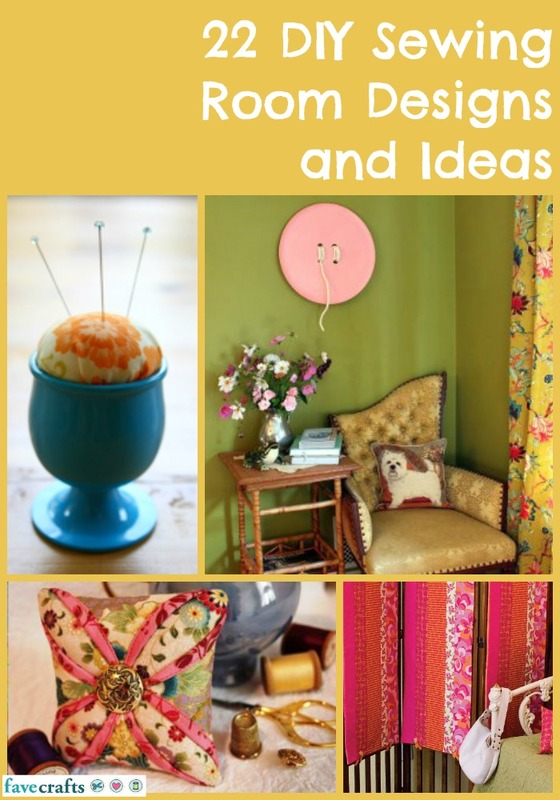 DIY Inspiration Board: Inspiration boards made with coordinating fabrics are the perfect addition to your sewing room design ideas. Magnet Board with Matching Magnets: Create an embellished magnet board with matching magnets, made with the scrapbook paper of your choice. Window Frame Blackboard: Use an old window frame to create an organization or inspiration board with three different elements: a blackboard, a chicken wire section for hanging and a magnet board. Chalkboard Coat Hanger: Organize your craft room with this cute coat hanger. Painted with chalkboard paint, this craft project can keep your craft aprons in order and be used to remind yourself of important notes. Pottery Barn Wall Organizer: Keep track of your awesome project ideas with this thrifty knockoff organizer. 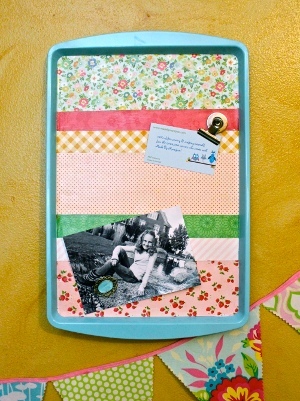 Dollar Store Cookie Sheet: Transform an old dollar store find into a virtual Pinterest board. Track your must-make projects and ideas with ease! What's the one thing every sewing room needs? Pincushions! These easy-to-make pincushions will help you keep track of those pesky needles as you sew, hem, cut, and stitch. 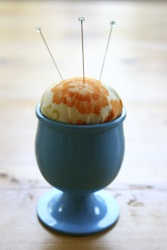 Egg Cup Pincushion: These little egg cup pin cushions are a cute way to add color and whimsy to your sewing room design ideas. These pin cushions also use up tiny scraps of fabric. Give as gifts to your sewing friends. Felt Donut Pin Cushion: Celebrate a sweet tooth with this fun donut pin cushion made with pink felt. You can even add sugar cookie or cake batter fragrance to the stuffing for extra fun. Use the blanket stitch to complete with pin cushion. Mini Cupcake Pin Cushions: Use bottle caps and scrap fabric to create these adorable little cupcake pin cushions. Arrange a collection on a cake stand for a fun and functional sewing room decoration. Canning Jar Pin Cushion or Treasure Jar: Turn a large mouth glass jar into a double-duty item for your sewing room. The top of the jar becomes a pin cushion which screws off to reveal your sewing supplies. Cathedral Pin Cushion: This Cathedral Pin Cushion is perfect for storing all your pins. Make one for yourself and all your friends! Cute and unique pin cushions like this make great gifts and are easy and fun ways to use up any fabric scraps you have lying around.